You only need to visit New England once to fall in love with this special part of the United States of America. Made up of six individual states, New England is home to a varied range of landscapes and cities, featuring everything from the high rise skyline of Boston to quaint coastal villages and an incredibly long list of historic sites and landmarks. It’s the home of Plymouth, also known as ‘America’s Hometown’ due to the fact that it was the first settlement formed by the Mayflower pilgrims, and many other old and historic towns and cities can be found all around the states of New England. Located in the southwestern part of the state, not far from the state border with Connecticut, Westerly is one of Rhode Island's best resort towns. Founded in 1661, Westerly has a relatively small population of around 22,000 and is quite a sleepy place for large parts of the year but really comes to life in the summer months when the sun starts to shine. The population of the city is twice as large as normal on a typical summer day, with many people flocking to Westerly, RI to check out the area's beautiful beaches. Many of Westerly’s beaches are among the most famous and popular in all of Rhode Island. Westerly is a city that has been standing for over three centuries now. It's an extremely beautiful and historic location, and one of the best towns to visit in Rhode Island. Nestled on the Pawcatuck River and offering some of the best beaches not just in the state, but in all of New England, Westerly is also one of the finest towns to come to if you're looking for sand, sea, and sun. Read on to learn some useful information about activities and amenities at the best beaches in Westerly, RI. Located on the most southwesterly point in all of Rhode Island, Watch Hill is an iconic natural landmark and a beautiful coastal village in the Westerly area. This is the sort of place that makes you simply stop and stare around in all directions, admiring the stunning natural scenery and the unique, old-fashioned cottages dotted about the landscape. The area has quite an exclusive past, with access to Watch Hill once being reserved to the rich and famous, but has changed over the years to become more of an open, welcoming place and an idyllic summer retreat for all to enjoy. Even if celebrities like Taylor Swift and Hugh Jackman are sometimes spotted in the area, it still retains a family-friendly atmosphere that everybody can appreciate. The name of this beach and the local village comes from a Native American word meaning 'end of pond' due to various large saltwater ponds located just off the beach, looking out onto the Atlantic Ocean. Weekapaug Beach is quite similar to Watch Hill in terms of beauty and atmosphere, but is quieter and calmer in general. If you get here on a good day, you might even be able to have a large part of the beach all to yourself. Huge granite boulders are dotted around the shoreline, creating some fantastic photo taking opportunities and views for sunbathers to admire as they work on their tans, and there are some good swimming areas here, with large pools of water being protected by the various jetties dotted along the beach. 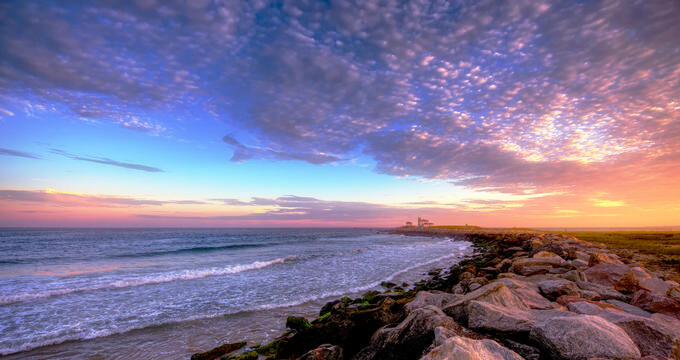 Probably the most popular and beloved of all the Westerly beaches, Misquamicut State Beach is exceptionally long and large. It runs for around three miles in total across the length of the Misquamicut barrier island all the way from Watch Hill to Weekapaug. There's a lot of space here for everyone to spread out and have fun in their own ways, so even on busy days, you never have to worry about feeling crowded out at Misquamicut State Beach. One of the best spots to check out here is the James J. Federico, Jr. Beach Pavilion area, which is fitted with restrooms, concessions, gazebos, and more. Special events are held at this beach each year too, so there’s always something new and exciting to look forward to at this Westerly beach. Beloved by Westerly locals, Westerly Town Beach offers a simple and thoroughly enjoyable seafront location for people of all ages to enjoy. It's right by Misquamicut State Beach, but tends to be more relaxing and calmer overall. Some gorgeous views of the Atlantic Ocean and Rhode Island coastline can be observed from Westerly Town Beach, and there's a real sense of romance in the air, especially in the evenings, making this a lovely beach for couples or newly-weds to walk along, hand-in-hand, and admire the views.